Skip the trashcan with your next shoe purge and get creative! From those ever faithful road shoes worn for multiple marathons, to those trail shoes collecting more dust than mud, let go. Worn out shoes can be put to use resurfacing tracks and playgrounds, while like-new shoes could be life changing to those without. 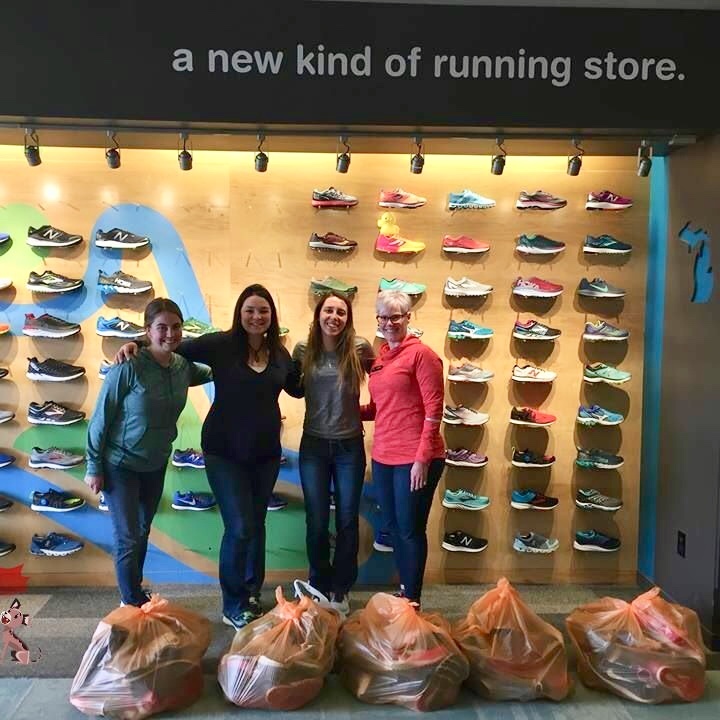 Running Lab has continued its commitment to find a place for your old running shoes. We sought out worthy organizations that will take your used running shoes and bring them to the less fortunate in the community and throughout the world. If you would like to contribute, please drop off your shoes anytime during store hours. World Vision is a Christian humanitarian organization dedicated to working with children, families, and their communities worldwide to reach their full potential by tackling the causes of poverty and injustice. Running Lab is proud to support Team World Vision & Detroit GLobal 6k for Water. By donating unwanted goods and recycling textile with ATRS, you’re keeping your neighborhood clean, improving the quality of life for those in need and protecting the environment for future generations. Proceeds from local donations to ATRS through Running Lab benefit the Michigan Humane Society. MORE is a Delaware-based non-profit that recycles and re-purposes used athletic shoes. With every 600 pair of shoes donated, MORE is able to fund 12 months of hands-on sustainable agriculture training for a family in Ghana. Community Sharing’s goal is to provide assistance to those in need, while also developing life skills to help empower those who need assistance. In 2014, Community Sharing assisted an average of 302 local families per month with an average of 10 new families added monthly. We also provide support to individuals that are unable to afford a pair of shoes. If you are a foundation or family looking for support please contact us. Running Lab offers educational sessions, training programs and Good Form Clinics to teams, businesses and organizations. These are for groups of all ages and levels. One hour sessions are conducted at the hosting group's location and can be held in the morning, afternoon or evening. To find out more and to check availability contact us.